Home » Television » DVD Info: Mannix coming to DVD. Home Entertainment Release Recap for June 15th, 2010. UFC Presents: The Best of WEC coming in September. HUNTER: The Complete Series coming in July. JESSE STONE: NO REMORSE DVD date announced. 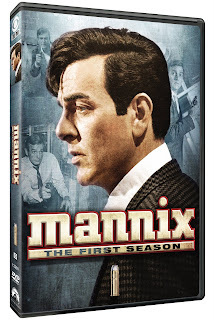 DVD Info: Mannix coming to DVD. Paramount/CBS has announced that season one of Mannix will be released, on DVD, on June 3rd. Joe Mannix (Mike Connors) was a private investigator that worked for a computer company known as Intertect. Keep in mind that this is 1967, so we are talking about computers that fill rooms and use punch cards. Looking up the 24 episodes on IMDB, I could not help but noticing a fair amount of special guests: Tom Skerritt, Neil Diamond, Neil Young, Stephen Stills, Richard Mulligan, Norman Fell, Army Archerd, Rona Barrett, and Karen Black. The only bonus I know of will be a new interview with Connors.